I play rhythm guitar in a couple of swing bands. I play a Gibson L7. I’ve tried lots of picks over the years, and these are the best ones for me. Love my mando pics! Arrived quickly. Great customer service. 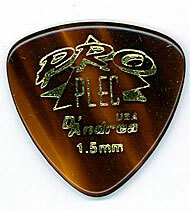 The Pro Plec 346 has minimal click on the strings, a dark sound, and is easily gripped. I’ve tried most of the non-boutique picks out there, and was pretty happy with the D’Andre Pro Plec 357, a classic Fender shape. The 346, its rounded triangle brother, produces a softer, quieter sound, and is less susceptible to wear. AND . . . its 3 tips are equivalent.